I have bookmarked few baking recipes from treat and trick blog and tried few of them. I find all her baking recipes are simple and easy to make at home with available ingredients what we usually have at our pantry. They also worked out well. As a first step, I am posting one of her simple, very easy but delightful semolina cookies. The authentic recipe calls for equal quantity of butter/ghee and sugar. but I have tweaked it to satisfy my family's taste buds. The cookies are also called as ghee cookies/biskut suji and they can be prepared with or without the semolina. They melt in your mouth when you taste them. If you are newbie baker, then I would suggest you to go for this cookies. Even your children can bake this. It is such an easy recipe! 1) Preheat the oven to 160C(320F). Place the baking paper in on baking tray. 2) In a mixing bowl, cream butter and sugar. 3) Add semolina and flour to this mixture. 4) Initially, it looks like bread crumble, but you can form a soft dough. Use your hand for making this. 5) Divide the dough into a big gooseberry size balls. Place them in baking paper by leaving an inch of space between them. Place the cherries on top of it. 6) Bake it for 15-20 minutes or until the cookies very slightly change in colour. 7) Transfer to a wire rock and cool completely. 8) Store in a air tight container. 1) Cut the glazed cherries into 4 and use them to decorate. As I used less sugar, I used half cherry to decorate. Sending this recipe to Bake Fest #2 hosted by Sangee of Spicy treats! wow...this looks so soft n crunchy,very nice recipe uma...thanks for sharing!! Very pretty looking cookies Uma......surely they would be delish. Delicious and perfect ones,very tempting!! Uma,You can link this to my event too..
wow... fabulous cookies... looks delicious... bookmarked..
WOW Uma, looks so............ beautiful. Fantastically captured. Very cute looking cookies...treat to the eyes. wonderful it looks - i agree treat n trick's bakes are amazing; they are much like the nankhatais I make ! these look gorgeous....i hav those same glazed cherries in the fridge...now i have a yummy treat to try with thm...thnks a lot!! Well baked Uma. love those cherries on top. you can link it to the event at my space. Very pretty! They are very similar to Nankhatai. Pretty looking cookies,these cookies tempts me a lot.. The cookies has come out really well..
looks very tempting and delicious. Lovely cookies. Gorgeous cookies, i will gobble it in no time. Wonderful recipe uma. cute, perfect and delicious cookies, absolutely yummy dear..
yumm yummy cookies,very interesting one with semolina ! Lovely cookies :) nice clicks as well.. Very beautifully prepared. Cookies looks crispy, crunchy and yummy. 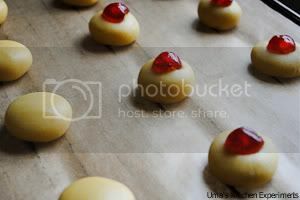 Isnt it very much like nankhatai, which I absolutely love...loved the way u decorated with cherries!! Beautiful cookies:) I didn't know we could use semolina and bake into cookies! I have also responded to your question on microwave cooking. Hope you find it useful! How long can the cookies keep? Hi Emily, I usually store these cookies in air tight container for a week and never stored beyond this time. These cookies are not very sweet. I already used less sugar and compensated it by placing the cherry on top of it. I feel 1/4 cup given in the recipe is correct but you can again reduce a tablespoon and not more than that. I made the cookies yesterday. And yup, didn't need to reduce the sugar. It was so nice, and crunchy. I was a bit lazy to form the soft dough and make them into balls, so after thoroughly mixing the crumbs, I pressed them into a teaspoon and voila! My mother loved it so much! Thank you for the recipe.